Let’s talk breakfast cereals for a moment. Some days, our family has cereal in the morning for breakfast but I make a point of reading labels when I go to the grocery store because I can’t stand the idea of putting excess unnecessary and unnatural ingredients in my body all in the name of convenience. My daughter and I always read the labels together so she’s quite aware that mommy won’t buy anything that has BHT in it. So, I was more than pleased when I came across the Kashi Organic Cinnamon Harvest cereal. I read the labels and was absolutely floored when I read the ingredient list: organic whole grain wheat, organic evaporated cane juice, organic cinnamon, natural flavour. That’s IT. WOW. So, I bought it. Honestly, is it possible for Kashi to make a cereal that is a) organic and b) with only 4 ingredients?? We opened the box for breakfast the next day. Kashi Organic Cinnamon Harvest cereal looks like rectangular spun strands of wheat similar to other more common sugar laced brands of whole wheat and I have to tell you, it tasted really really good. They’re bite size for adults but if they’d be 2 bites for your child. The Kashi Organic Cinnamon Harvest cereal was really crunchy, had a hint of sweetness without being too sweet, definitely tasted like cinnamon, and definitely DID NOT taste like cardboard. It tasted really really natural. It left no odd aftertaste and my daughter loved it too. She also enjoys eating them without milk as a crunchy snack. Sometimes, we’ll just pack them up in a little re-sealable bag as a travel snack which is a pretty healthy option (goes really well with applesauce on the go). She calls the Kashi Organic Cinnamon Harvest cereal her “cinnamon rectangles”. Note though: if you eat them dry, they can get a little messy since the strands of wheat do come apart after the first bite. Yes, I a m definitely buying Kashi Organic Cinnamon Harvest cereal and I may even be tempted now to try some of their other cereals. 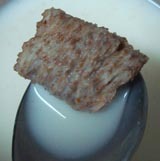 Honestly, I am impressed by how fresh and natural the cereal tastes. If you’ve never compared your cereal labels before, now would be a really good time. I mean, if Kashi can make this cereal taste so good and fresh without using BHT in their lining to maintain product freshness, you have to wonder why other companies use that chemical for their cereals. This one is a no brainer: healthy, lots of fibre, and tastes good. Need I say more? Note: the Kashi website talks about all their products but their cereals page isn’t designed very well. When you go to the cereals page, it only displays 3 types of cereals. You have to click on this little brown circle and drag it across the screen to see their entire line of cereals. Keep that in mind if you decide to visit their website. Amazing job! This is exactly the kind of stuff that should be spread around the internet. Shame on the search engines for not displaying this post higher! Could not thank you more than enough for the articles on your web site. I know you placed a lot of time and effort into them and truly hope you know how much I appreciate it. I hope I will do the identical thing for another individual one of these days. Do you have a facebook group for your blog? Ahoi there, always enjoy reading your blog posts. Keep up the good Work! I couldn’t currently have asked for a more rewarding blog. You’re always at hand to provide excellent information, going on to the point for straightforward understanding of your website visitors. You’re really a terrific expert in this arena. Thanks for remaining there for an individual like me. Fantastic piece of writing, lots of the material was incredibly helpful. I believe that avoiding packaged foods would be the first step in order to lose weight. They might taste beneficial, but refined foods contain very little vitamins and minerals, making you take more just to have enough electricity to get with the day. If you are constantly taking in these foods, converting to whole grain products and other complex carbohydrates will help you have more strength while having less. Good blog post.